For the nineteenth time, Full Tilt is running out it’s popular Full Tilt Online Poker Series. 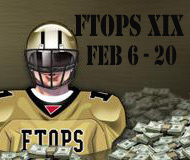 Forty-five events will be spread between Feb 6-20, with $22 million in prize money guaranteed, along with a gold FTOPS jersey for each event winner. FTOPS XIX will also include all the standard, big money events, including the $2 million guaranteed two-day event and the $3 million guaranteed Main Event. Running exactly one month after FTOPS XIX will be the sister-series Mini FTOPS. From March 6-20, MiniFTOPS will deal out all the same events, but at 1/10th of the buy-in. More than $8 million is guaranteed in the series, which includes a new $1,000 + $60 No Limit Hold ‘em Heads-Up tourney and the $1.25 million guaranteed Main Event. Satellites are running now on Full Tilt. If you do not have a Full Tilt Poker account yet, download it now to get in early on the cheap seats and freerolls. Enter the bonus code “MPONLINE” to earn a 100% bonus up to $600 on your first deposit.